A Live USB drive will allow you to test drive CentOS without installing it. The same Live USB drive can also be used to install CentOS. If your search is for a Linux distribution that is free, has enterprise-class quality, and still community-driven, you should look no further than the CentOS. It is one of the best Linux distros out there. CentOS is a compatible rebuild of the Red Hat Enterprise Linux. It means you get a community-developed Linux distro with full compliance with Red Hat’s redistribution requirements. In a nutshell, CentOS is a Red Hat Linux excluding certification and support. Are these enough reasons to test drive CentOS? Like any other Linux distribution, the best way to test drive CentOS is by using a Live USB drive. Therefore, start by beginning to download an ISO image. Before heading to the download, let me quickly brief about the two different ISO variants available at the official site. CentOS ISO downloads are available in two different variations – Minimal ISO and DVD ISO. So what are these? The Minimal ISO image download size is less than a GB. Therefore, you can use a 1GB USB drive to create the installation media. During the installation process, more packages are downloaded and installed. Therefore, this is the best option if you have a fast network connection on the computer where you will be installing CentOS. On the other hand, a DVD ISO comes with a full-fledged desktop installation with all packages built within the ISO. It is an ideal method if you don’t have a network connection on the target computer or maybe you are using the same image on multiple computers, avoiding you to download the same packages repeatedly. One more important thing is the capability of test driving the CentOS without installing it, called a Live environment. It is possible only from a DVD ISO image. Minimal ISO won’t give you a Live environment. Head over to the CentOS website and grab your ISO. If you have downloaded Minimal ISO, you will need at least 1GB USB drive. DVD ISO users need to have a USB drive of minimum 5GB capacity. The USB drive is formatted during the process, hence take a backup of data in it. 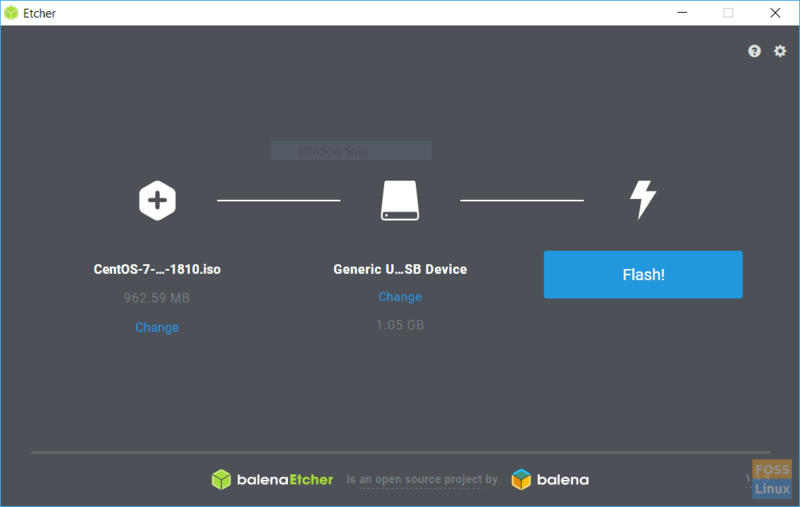 Etcher is an OS image flasher on to an SDCard or USB drive. The biggest advantage of using Etcher over other image flashers is it can only detect the SD and USB drives. Hence it protects you from accidentally writing the ISO image to your hard-disks. 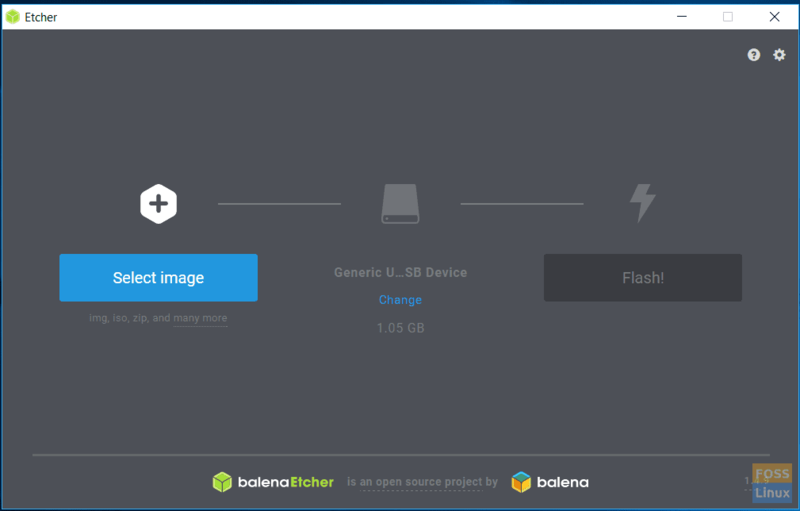 Etcher is a free and open-source application. Run the exe file and install the program. Here is the final step you need to do to wrap things up. Plugin the USB drive and then run Etcher. Click “Select image” and select the CentOS ISO file that you downloaded earlier. Click “Flash” and sit back and relax. When the flashing is complete, your shiny new CentOS Live USB drive or the installation media is ready for use. You need to set the USB drive as the priority in the ‘Boot Order of the System’ BIOS setting.